Provides methods to build edges. Makes an edge on the whole curve. Add vertices on finite curves. Make an edge on the curve between parameters p1 and p2. if p2 < p1 the edge will be REVERSED. If p1 or p2 is infinite the curve will be open in that direction. Vertices are created for finite values of p1 and p2. Make an edge on the curve between the points P1 and P2. The points are projected on the curve and the previous method is used. An error is raised if the points are not on the curve. Make an edge on the curve between the vertices V1 and V2. Same as the previous but no vertices are created. If a vertex is Null the curve will be open in this direction. The general method to directly create an edge is to give. The curve must not be a 'null handle'. Vertices may be null shapes. When V1 or V2 is null the edge is open in the corresponding direction and the parameter value p1 or p2 must be infinite (remember that Precision::Infinite() defines an infinite value). The parameters must be in the parametric range of the curve (or the basis curve if the curve is trimmed). If this condition is not satisfied the edge is not built, and the Error function will return BRepAPI_ParameterOutOfRange. If the parameter values are given in decreasing order the vertices are switched, i.e. the "first vertex" is on the point of parameter p2 and the "second vertex" is on the point of parameter p1. In such a case, to keep the original intent of the construction, the edge will be oriented "reversed". On a periodic curve the parameter values p1 and p2 are adjusted by adding or subtracting the period to obtain p1 in the parametric range of the curve, and p2] such that [ p1 , where Period is the period of the curve. A parameter value may be infinite. The edge is open in the corresponding direction. However the corresponding vertex must be a null shape. If this condition is not satisfied the edge is not built, and the Error function will return BRepAPI_PointWithInfiniteParameter. The parameter values can be omitted, they will be computed by projecting the vertices on the curve. Note that projection is the only way to evaluate the parameter values of the vertices on the curve: vertices must be given on the curve, i.e. the distance from a vertex to the curve must be less than or equal to the precision of the vertex. If this condition is not satisfied the edge is not built, and the Error function will return BRepAPI_PointProjectionFailed. Giving vertices is useful when creating a connected edge. If the parameter values correspond to the extremities of a closed curve, points must be identical, or at least coincident. If this condition is not satisfied the edge is not built, and the Error function will return BRepAPI_DifferentPointsOnClosedCurve. The vertices or points can be omitted if the parameter values are given. The points will be computed from the parameters on the curve. The vertices or points and the parameter values can be omitted. The first and last parameters of the curve will then be used. Returns the constructed edge. Exceptions StdFail_NotDone if the edge is not built. another value of the BRepBuilderAPI_EdgeError enumeration indicating the reason of construction failure. Defines or redefines the arguments for the construction of an edge. 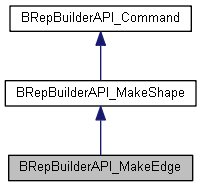 This function is currently used after the empty constructor BRepAPI_MakeEdge(). Returns true if the edge is built. Returns the first vertex of the edge. May be Null. Returns the second vertex of the edge. May be Null. the highest parameter on the curve along which the edge is built. It does not correspond to the first or second vertex given at the time of the construction, if the edge is oriented reversed. Exceptions StdFail_NotDone if the edge is not built.